My last post was about Allie's abnormal blood work. She had abnormal organic acid blood work. After that, she had plasma organic acid blood work and a urine sample done. All results from those came back normal. However, due to the organic amic acids coming back abnormal, we are proceeding with a Geneticist as the Marshfield Clinic and we are hoping to have some metabolic genetic testing done. Allie's appointment is scheduled for April 12th. We met with Allie's Neuro Psychologist a couple weeks ago and they did her behavior analysis. I got the results through a phone call this week (due to bad weather) and for her congnitive skills, she's in the the normal range. For spacial skills, she's in the high normal. 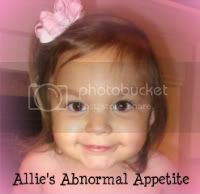 The doctor confirmed that Allie's behavior is not typical 3 year old behavior, it's due to her chronic medical condition. Her Psychologist is recommending behavior therapy once a week. 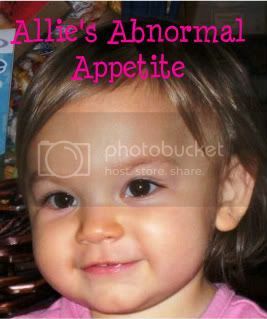 During this therapy, they are hoping to understand Allie better and hoping that she will help them determine if her bad behavior is due to pain, depression, anger, etc. Matt and I haven't fully decided if we are going to proceed with the behavior therapy - but most likely we are. Allie had an endoscopy last Friday. This was ordered because Allie cannot handle full feedings. Anything over 3 oz and she vomits. During her last Upper GI Series, (a couple weeks ago), the Radiologist saw inflammation in her intestines. In addition, Allie has been complaining of stomach's aches daily. Her endoscopy went well. It was very hard to hand her over to the doctor this time - she's older now and understands everything that is going on. The doctor said that he seen a lot of infammation in her intestines but everything else looked good. Got the biopsie results this week and everything came back normal. They checked her for celiac disease, deep tissue inflammation, lactose intolerance and the ability to digest certain sugars. Everything NORMAL!!! Everything always seems normal, yet my little girl is not the norm. It's fustrating when all the results come back normal. Overall Allie is still doing good. She still is not able to handle her full feedings and she still complains of belly aches but besides that's she good. She is still spunky as ever :-). Thank you for the continued prayers - we are continuing to search for answers so Allie can feel 100% healthy again!